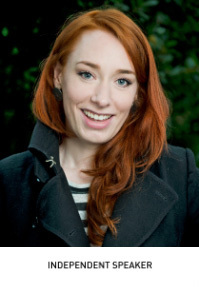 Dr Hannah Fry is a lecturer in the Mathematics of Cities at the Centre for Advanced Spatial Analysis at UCL. She works alongside a unique mix of physicists, mathematicians, computer scientists, architects and geographers to study the patterns in human behaviour - particularly in an urban setting. Her research applies to a wide range of social problems and questions, from shopping and transport to urban crime, riots and terrorism. Alongside her academic position, Hannah is an experienced public speaker giving conference keynotes and taking the joy of maths into theatres and schools. Hannah’s mathematical expertise has led to the development of fascinating documentaries including ‘Britain’s Greatest Invention ’, ‘Horizon: How to Find Love Online’, ‘Horizon: 10 Things You Need to Know About the Future’, ‘City in the Sky’ (BBC2), ‘Trainspotting Live’, ‘The Joy of Data’, ‘Climate Change By Numbers’ and ‘Calculating Ada: The Countess of Computing’ (BBC4). For radio, Hannah presents ‘Music By Numbers’ (BBC R1), ‘The Curious Cases of Rutherford and Fry’ and ‘Computing Britain’ (BBC R4). As an author, Hannah has written two books: ‘The Indisputable Existence of Santa Claus: The Mathematics of Christmas’ (Transworld, 2016) which followed ‘The Mathematics of Love: Patterns, Proofs, and the Search for the Ultimate Equation’ (Simon & Schuster/ Ted, Feb 2015) in which Hannah brings together mathematical equations to provide answers to such questions as: What’s the chance of us finding love? What's the chance that it will last? How does online dating work, exactly? When should you settle down? How can you avoid divorce? When is it right to compromise? Can game theory help us decide whether or not to call?